Farhh rounded his racing career off in the best possible style when holding off Cirrus Des Aigles by a neck to win the QIPCO Champion Stakes. The injury-plagued five-year-old, trained by Saeed bin Suroor, won the Lockinge at Newbury back in May but yet another setback had kept him off the track until now. Advertising the skills of his handler, Farhh needed to have stamina and courage in equal fashion as Silvestre de Sousa kept him up to his work to hold off the 2011 winner Cirrus Des Aigles by just a neck, with Ruler Of The World, the Epsom Derby winner, another half a length away in third. Both the first and second had been no match for Frankel last year, but with one champion retired to stud, the space was there for another star to emerge. 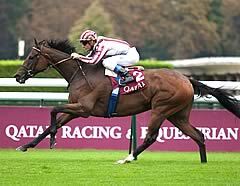 Cirrus Des Aigles ran an amazing race for a seven-year-old and Ruler Of The World bounced right back to his best after disappointing in the Arc two weeks ago. Of the rest, Hillstar ran too keen early on, while Mukhadram, employing different tactics after being dropped out, stayed on one-paced to finish fifth, behind Hunter's Light. De Sousa said: "He travelled like a dream, and like the winner, through the race. He's a marvellous horse and I'm delighted." Bin Suroor added: "He's a great fighter - every year he has had problems. He's a great horse and I'm so happy. He had to have a break after winning the Lockinge. He's been a miler in the past but he did it really well today over 10 furlongs, especially in that ground. He'd been on good to soft, but it was heavy today. "You have to look after him really well just to keep him sound. It wasn't really easy to train him, if you put any pressure on you know what will happen. He looked the best ever today and he ran his greatest race. "He is a great horse and I'm so happy. He'll be retired now and he'll go to stud." The Godolphin racing manager, Simon Crisford, commented: "It was a great performance and Saeed (bin Suroor) has done a brilliant job in getting the horse back. 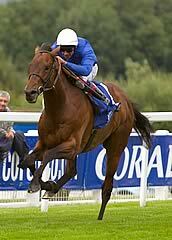 "After winning the Lockinge in May, Farhh had a flake taken out of his ankle. "This victory was not a real surprise - he was the highest-rated horse going into the race. "The trip didn't worry me, we were more concerned about coming into this race after a long lay-off. "But he is five, going on six, and will retire to Dalham Hall Stud, while Dawn Approach has also run his last race and is going to stand at Kildangan Stud in Ireland. "Farhh is all heart and wants to fight and wants to race. If you remember, he won the Thirsk Hunt Cup off quite a handy mark so he has progressed well from there! "We kept finishing second to Frankel last season, but we knew Farhh's day would come. "This makes Godolphin champion owner for the ninth time in 17 years so victory is very sweet and QIPCO Champions Day at Ascot is one of the great racing events of the year." Another terrific performance by Cirrus Des Aigles in the £1.3-million QIPCO Champion Stakes saw him finish runner-up for the second time. The seven-year-old gelding, whose record in the race also includes victory in 2011, was beaten a neck by Farhh, with this year’s Investec Derby winner Ruler Of The World half a length back in third. Christophe Soumillon, who rode Cirrus Des Aigles for trainer Corine Barande-Barbe, said: “I had a good ride and when we turned into the straight I thought we were going to win. I knew Farhh was the horse to beat so I tried to follow him, but unfortunately when I got to him he found more. The trainer thought that if I had got going earlier it might have been better, but in the last 100 yards you could see the winner kept going quite easily. Trainer Corine Barande-Barbe said : "He's run a very good race, having come back for the third year in a row. But I felt because of his bad draw it meant he couldn't get out before Farhh, who had a bit of a start on him, and you can't afford that against a horse like him. "I hope he has silenced the doubters who have criticised him this year and hopefully he will come back next year..I don't know if he'll run again this year, it's up to the owners." Aidan O'Brien said of Ruler Of The World: "He has run a tremendous race against older horses and he's another horse to look forward to next year over 10 furlongs or a mile and a half."